Matt James leads a group of underprivileged kids on food tours of New York's Lower East Side. Matt James (’14) moves backward down the sidewalks of manhattan’s lower east side with the finesse of the football player he once was. 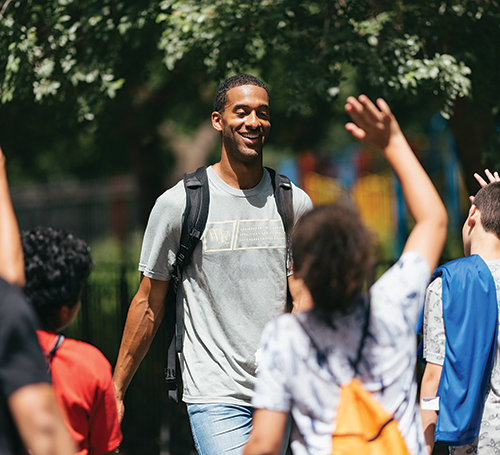 At 6 feet 5, this towering Pied Piper in jeans walks and talks with the nine young students and two teachers he is leading on a lunchtime tour of restaurants. “Somebody be my eyes,” Matt calls out, and Ryan, a thin, handsome young bundle of energy who finds Matt “very cool,” rushes to his side. 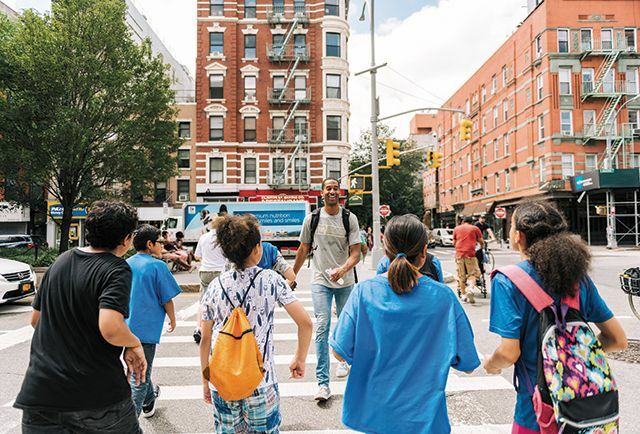 Throughout the three-hour tour, Ryan and other students from Public School 188 pull their 26-year-old guide by his elbow or his Wake Forest T-shirt anytime he’s in danger of backing into a crosswalk pole or dropping into one of New York’s treacherous open cellar stairways. These students and everyone at P.S. 188, known as the Island School, are not just classmates, friends and colleagues. They are a self-declared family, committed to watching out for each other, and Matt has become a big brother. About half the students live in temporary housing, many in a domestic violence shelter across from the school on East Houston Street. Virtually all the students are low-income. Some live in one-room apartments with a dozen or more family members crammed together. Their lives don’t normally include anything as extravagant as food tours: trying out lobster rolls at Luke’s Lobster or spooning strawberry gelato while sitting on red Italian scooter seats at Gelarto. But Matt, who grew up with a financially struggling single mom in Raleigh, North Carolina, wants these elementary and middle school children to understand that their horizons are closer and brighter than they might think. He learned that lesson at Wake Forest and wants to share it. Matt works full-time as a researcher at CBRE commercial real estate and operates ABC Food tours for paying tourists. As an expression of his Pro Humanitate passion, he offers the tours once a month for P.S. 188 students for free, wanting them to taste the same foodie morsels as the tourists, paying the difference himself if online and restaurant donations don’t cover the costs. Each tour includes a donation of socks for a homeless family and revelations for the children that many of the restaurant owners overcame disadvantaged beginnings to reach success. The owner of Pause Cafe, Matt tells the students, immigrated from Morocco at age 24 and realized his dream of opening the cafe. They learn that the owner of Miss Lily’s diner has donated more than $4 million to early childhood education in Negril, Jamaica. They hear that the owner of Luke’s Lobster walked away from Wall Street because it wasn’t making him happy, and he now has 28 locations. “I want to get your head working.” That’s how Matt begins the tour on this August morning, starting out with a game of Fact or Fiction. Matt James laughs with kids at Miss Lilly's Diner, one of the stops along his food tour of NYC. Matt has lived in New York for about a year now, a world he couldn’t imagine when he was growing up in Raleigh. His father was absent, and money was tight. “The community really rallied around us and made sure I had what I needed,” Matt says. His mother — “the most faithful person I’ve ever known” — has been his greatest inspiration, backing whatever he wanted to do and nurturing his soul in the church. As a high school football standout, Matt had scholarship offers from Syracuse and the University of Kentucky, but he wanted to stay in his mother’s orbit so she could see his games. He met people from so many different backgrounds who had been places he’d never been, who assumed they would do great things, who opened his eyes to new paths. 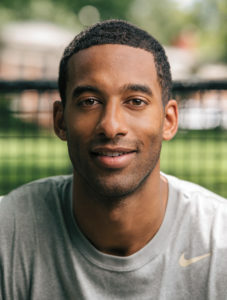 He played both basketball and football in high school but chose football for college because, despite a listed 36-inch vertical jump, “to be honest, I had no jump shot.” He says basketball actually left him with more injuries than the tally of bones broken by football: he was redshirted his freshman year at Wake Forest and missed 16 games in three years with a broken collarbone, a separated shoulder and a broken hand. Thanks to his injuries, his Wake Forest career statistics were just fair, though he had nine receptions and 87 yards in his best game, the 2014 season finale against Duke. He made good use of his time in Winston-Salem. At Solid Rock Baptist Church where several students attended services, he met Chris Leak (’85, P ’11), a vice president at Morgan Stanley Wealth Management and a member of the Wake Forest Board of Visitors. Leak saw great promise in Matt. Matt, an economics major, was interested in wealth management, so Leak helped him get an internship with Morgan Stanley. Matt also did stints at Merrill Lynch, Verger Capital Management LLC and Davenport & Co. LLC. Matt was right about plan B. He gave himself a year to make it in the NFL, but he didn’t make the cut with the Carolina Panthers and was cut, called back and cut again by the New Orleans Saints. He shifted gears, and PNC Bank in Pittsburgh hired him. He made so many weekend visits to see former teammates living in New York City and loved it so much that he moved there. Matt was excited by all that Manhattan had to offer, including food. He began posting his restaurant gems on Instagram and guided so many visiting friends that he decided to do it for profit. When he heard Rachael Ray, the TV food maven, talk about her charitable Yum-o! nonprofit, the student tours popped in his head. He had loved the football team’s time with kids through the tutoring program, Santa’s Helper, Eat With the Deacs and other events. “Children really listen to you and look up to you,” he says. He lives on the Upper West Side because he finds its green spaces restful and full of places to run. He works out constantly — the only way he can eat all he wants. But the Lower East Side has the diversity of restaurants he likes. And it has P.S. 188 and Principal Suany Ramos. 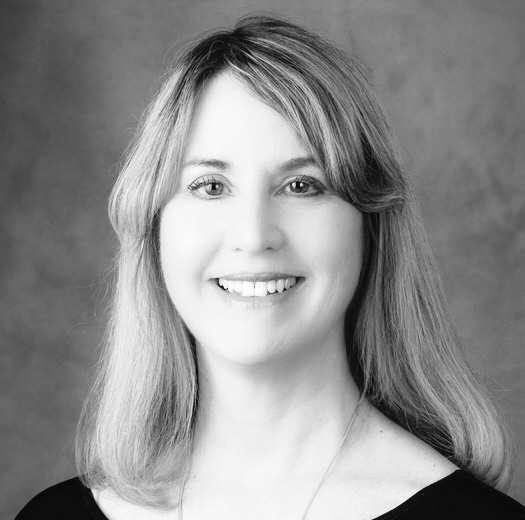 She is a dynamo who rallies her staff like a general, yet she’s a child-whisperer, able to soothe students (and sometimes their parents) who are screaming and acting out. She has been known to walk and talk with a student for two hours to bring the child from tantrum to calm. P.S. 188 is a school of choice, drawing students from distant boroughs, up to two hours by bus and train. Chaotic lives play havoc with schedules. Transient students show up or exit every week. Many speak little English. The school tries to serve every need that distressed families have. It’s open from 6:30 a.m. to 7 p.m. Monday through Saturday for most of the year. Children get three meals a day, uniforms, backpacks of food, after-school care, dental care, counseling, eyeglasses, a Christmas present and huge amounts of love and respect. Their parents can do laundry there once a week, find legal advice, come to Thanksgiving dinner, attend parenting classes, work on their GED or just vent frustrations. Most of this assistance is supported with grants and partnerships that Ramos and her staff seek out. Ramos at first was skeptical of Matt’s offer to do the tours. “We pay nothing, and you do all the work?” she asked him. But he has earned her trust. Perhaps most important, the children see people in their neighborhood who have risen to own their own businesses, Ramos said. Matt also regularly picks up and delivers a huge bag of donated bagels to the school. “Every day. Who does that?” Ramos said. 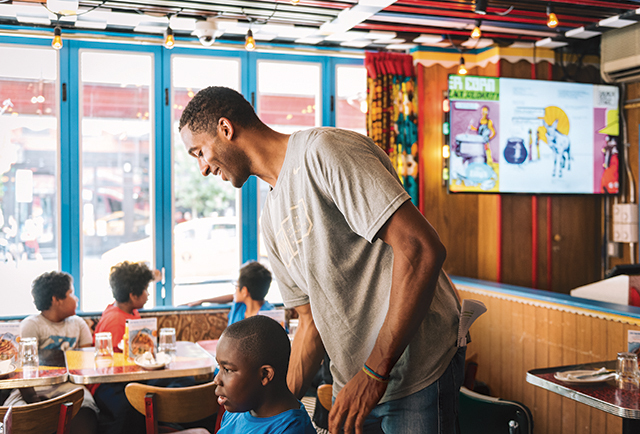 In Miss Lily’s air-conditioned diner, the skewers of jerk chicken, green peppers and plantain and the banana pudding are almost gone, and several kids are giggling over a messy design they’ve made on a plate of leftovers. Matt asks, “What does that look like?” One girl answers, “My life.” The kids laugh. Another girl stares at the plate and says, “I see my soul. I see nothing.” She gets more laughter, and she smiles, but the air holds a poignancy. The shop owner Chris Pugliese beams as he leads the kids to the basement where bagel dough is kneaded each morning. He’s been making bagels since he was 15. Soon he is sitting on a stool next to Pugliese. “I’m sitting with the Bagel Man! Thank you, Bagel Man,” he says, hugging the owner tightly. The tour ends, and students head back to school with the teachers. Matt, meanwhile, has more plans on the horizon. He hopes to partner with New York and Fordham universities to have their tourism students operate the paid food tours. He does, after all, have a full-time job. But he says he’ll keep taking the kids on tours himself as long as he can. Learn more about ABC Food Tours at www.abcfoodtours.com. See a video about the tours at bit.ly/2MsN5a0. Read more about P.S. 188 in The New York Times at nyti.ms/2P76CeJ.